AC generators are widely used to produce AC voltage. To understand how these generators operate, the function of each component of the generator must first be understood. The field in an AC generator consists of coils of conductors within the generator that receive a voltage from a source (called excitation) and produce a magnetic flux. The magnetic flux in the field cuts the armature to produce a voltage. This voltage is ultimately the output voltage of the AC generator. The armature is the part of an AC generator in which voltage is produced. This component consists of many coils of wire that are large enough to carry the full-load current of the generator. The prime mover is the component that is used to drive the AC generator. The prime mover may be any type of rotating machine, such as a diesel engine, a steam turbine, or a motor. 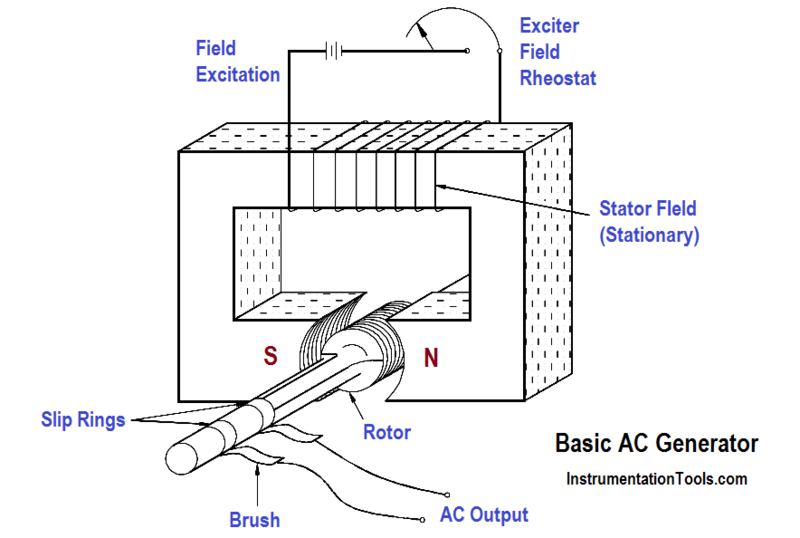 The rotor of an AC generator is the rotating component of the generator, as shown in Figure 1. The rotor is driven by the generator’s prime mover, which may be a steam turbine, gas turbine, or diesel engine. Depending on the type of generator, this component may be the armature or the field. The rotor will be the armature if the voltage output is generated there; the rotor will be the field if the field excitation is applied there. The stator of an AC generator is the part that is stationary (refer to Figure 1). Like the rotor, this component may be the armature or the field, depending on the type of generator. The stator will be the armature if the voltage output is generated there; the stator will be the field if the field excitation is applied there. Slip rings are electrical connections that are used to transfer power to and from the rotor of an AC generator (refer to Figure 1). The slip ring consists of a circular conducting material that is connected to the rotor windings and insulated from the shaft. Brushes ride on the slip ring as the rotor rotates. The electrical connection to the rotor is made by connections to the brushes. Slip rings are used in AC generators because the desired output of the generator is a sine wave. In a DC generator, a commutator was used to provide an output whose current always flowed in the positive direction, as shown in Figure 2. This is not necessary for an AC generator. Therefore, an AC generator may use slip rings, which will allow the output current and voltage to oscillate through positive and negative values. 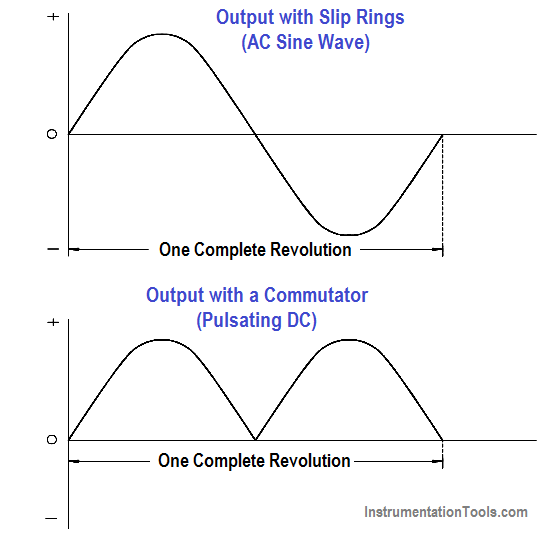 This oscillation of voltage and current takes the shape of a sine wave.